2014 marks the 75th anniversary of the Diocese of Gallup. To celebrate this occasion, the Voice will be frequently posting histories of the parishes, churches, missions and peoples throughout the Diocese, starting with the oldest and moving forward. Acoma is the oldest church in the Diocese, and will kick off our series. The parish of Acoma, originally established in 1629, dates as the oldest in the Gallup diocese and probably the oldest in the United States. The early Spanish history in Acoma records both dedicated parish priests and martyrs. Just how long the Acoma Indians have lived on top of Acoma before the coming of the white man cannot be determined with any degree of accuracy. However, Acoma tradition has it that they lived there several hundred years before Coronado’s time. And before that they lived on top of the Enchanted Mesa and in a village near the site of the present Cubero. The ﬁrst white man to hear of Acoma was the Franciscan Friar Marcus de Niza in 1539. The first European to enter the City in the Sky was the Spaniard Francisco Vasques de Coronado in 1540. He was well received by the Acomas. Acoma was visited by Onate in 1598 with his band of 400 soldiers. He also was well received. On December 4, 1598 Juan de Zaldivar was killed at Acoma. On January 21, 1599 Vicente de Zaldivar returned to Acoma with an army to avenge his brother’s death. Thus took place the famous three day battle during which many of the Indians and Spaniards were killed, after which the Acomas submitted to Spanish Rule. This battle began on January 22nd and lasted until noon of January 24th. On August 10, 1680 the Acomas joined the other Pueblos in the Great Uprising. In 1692 they surrendered to Diego de Vargas the reconqueror of New Mexico. In 1696 they again revolted and when Vargas marched against them he could not storm the Rock. This revolt remained unpunished. Since this time the Pueblo has enjoyed peace. The Acoma Catholic church, dedicated to San Estevan, was built in 1629. It is not known if the church was damaged during the Pueblo Revolt and rebuilt in 1699. But the church, well maintained by the Acoma people, stands today in eloquent tribute to the workmanship and care of the people. During the Mexican period, priests visited the area rarely and many functions were handled by the sacristans. After the Americans took over, visits became more frequent, but still hit or miss. 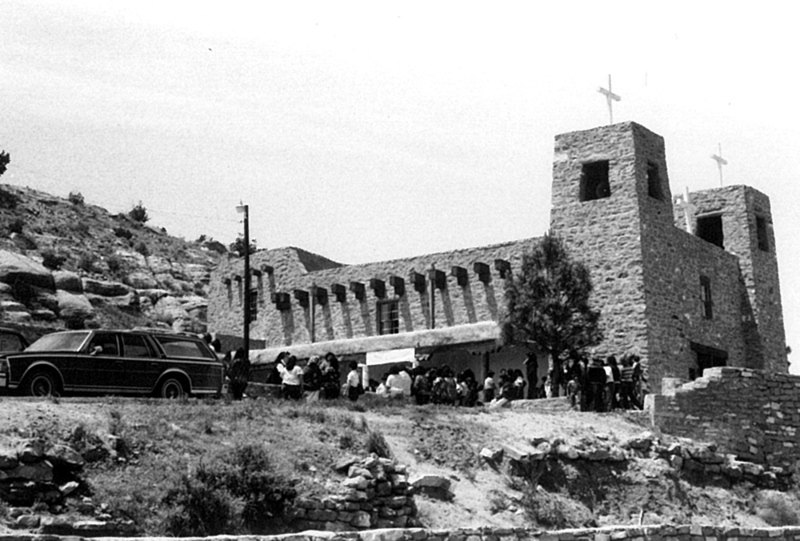 Near the turn of the century, priests from Seboyeta and San Rafael included Acoma on their mission rounds. The church at McCartys can be seen to the south of I-40 after passing east of Grants. After 1910, with the arrivals of the Franciscan McCarty’s Santa Maria de Acoma Mission priests, the care of the Acoma people again was provided by that group of priests who had done so much for the people in the early centuries of the church at Acoma. The priests from Gallup visited the village until 1920 when San Fidel became a parish. Priests from there continued to serve the population of Acoma and the growing villages of Acomita and McCartys, until 1966, when it was again established as a canonical parish. Although the church of San Estevan at Acoma is the mother church of the parish, services are held there primarily on major feast days. More and more, the people have moved into the more modern villages of Acomita and McCartys, returning to the mesa village only for feasts and ceremonies. In 1888, a mission (San Lorenzo) was established at Acomita with the construction of a church and a Mission Santa Ana at Acomita school. The school did not persist and on Christmas, 1939, a beautiful new church, constructed under the direction of Father Agnellus Lammert, OFM, was dedicated, this time to Saint Anne. A parish hall was constructed there in 1967 and quarters for the priest in 1970. In 1971, a trailer was purchased to serve as a convent for the sisters teaching CCD to the children. Father Agnellus also constructed the beautiful church of Santa Maria de Acoma at McCartys. This impressive structure, up on the hillside, was dedicated on November 28, 1933, by Archbishop Gerken of Santa Fe. A parish hall was constructed there in 1969. The construction of this hall and the one at Acomita were under the direction of Father Conran Runnebaum, OFM. Impressive fiestas in honor of the patron saints are held at all three villages. The San Estevan main fiesta is held on Sept. 2, with another held on December 26. Santa Ana is honored on August 10 at Acomita, and Santa Maria de Acoma on the first Sunday in May. Father Wayne Gibbeaut, OFM, is the current pastor. This mission, dedicated to St. Stephan, the protomartyr of the Catholic Church, was established in the year 1629 by Friar Juan Ramirez, one of the early Franciscan Missionaries to New Mexico. The church, built in the early Pueblo style of architecture is unique and the largest of the early New Mexico Missions. It is built of adobe brick and mortar and was ten years in building. All the adobe bricks as well as all materials for the building had to be carried to the top of the Rock by the Acoma Indians of those days. The work was done by the Acoma Indians under the direction of Friar Ramirez. Whether the Mission buildings were destroyed in the great Pueblo Uprising of 1680, or not, is a disputed question. Some claim the present building is the original; others claim the original was destroyed in 1680 and rebuilt in 1699. The mission church at Acomita, NM. Friar Juan Ramirez, who according to Acoma tradition was beloved by all, lived at Acoma for 26 years, teaching the Indians the rudiments of the Catholic Faith as well as the more practical ways of farming and building. He gained access to Acoma by a miracle. The Indians were suspicious of the Spanish and resented especially Spanish Soldiers, so the Missionary was not invited to Acoma. However, Friar Juan Ramirez started out alone from Santa Fe on foot, and when he approached the bottom of the Rock, the Indians on top threw rocks at him, hoping to frighten him away. But in the excitement a small girl fell from the ledge, and was considered killed by those on top who could not see over the ledge. The child miraculously fell into the arms of Friar Ramirez who brought her unharmed to the top. The Friar was then accepted by the Acomas. This incident happened at the famous Padre’s Trail — the shortest path to the top of the Acoma Rock. The Hand-Carved Altar. The four posts are hewn from native pine logs and they as well as the panels or frame work around the old Spanish paintings are hand-carved with crude tools. The Old Statue of St. Stephan —- in the niche above the center of the Altar. This is a hand-carved statue of early date and is highly venerated by the Acoma Indians. It is reverently carried in solemn procession on their Fiesta, Day— September second — to the plaza and is placed in a specially prepared shrine until sundown when it is carried back to its place in church. The Painting of St. Joseph and the Christ Child – on the Gospel side of the Sanctuary. This painting was a gift of King Charles II of Spain to the first Missionary to the Acomas (Friar Juan Ramirez) and was brought by Friar Ramirez to Acoma. This is the picture that caused serious trouble between the Acoma and Laguna Indians during the last century. It was borrowed by the Lagunas for a year and was not brought back in time. When the Acoma Indians went to Laguna to carry back their picture, the Lagunas claimed it as their own. Bloodshed was prevented by Friar Mariano de Jesus Lopez when he persuaded both the Acomas and Lagunas to have the matter settled in Court.The trial in the Supreme Court of the new Territory of New Mexico was the earliest important case in the history of this Court. Judge Kirby Benedict ordered the picture returned to Acoma and it is here since that time – 1848. The painting, supposed to be the work of one of the Masters of the 17th Century, was mined some years ago by an Indian in an attempt to restore and preserve it. The logs that support the roof. These are from 12 to 19 inches in diameter and over 40 feet long. They had to be carried on the shoulders of the Indians from the mountains – a distance of at least 30 miles and hoisted to the top of the Rock with grass ropes. In 1906 part of the roof caved in and ﬁve logs were replaced. The High Windows – One reason for their position was that the church was used as a fortress in case of attack by the enemy. All the people in the Pueblo would enter the church and bar the large front door. The Stations of the Cross – These are some of the ﬁrst prints of this type of lithography – a hundred years old – 1841. The old bells in the tower – The one was cast in 1710, the other is claimed by some to be a 15th century bell from Spain or Mexico. The Old Cemetery in front of the Church. This represents a stupendous amount of labor and toil. After building a 40 foot wall around it, all the ground to fill the space had to be carried to the top from the valley below. The old Convent, partly in ruins. This evidently was built as a Retreat House for the early Padres. It is too large for a residence and too small to be used as a barracks. The Old School Room on the second ﬂoor of the Convent – in ruins. This was one of the earliest classrooms in America. The Rough Streets of Acoma over which the three Padres – Friar Cristobal Figeuroa, Friar Albino Maldonado and Friar Juan de Mora – were dragged behind burrows and received the crown of martyrdom in the Pueblo Uprising of 1680. The Crag over which the Spaniard made the sensational jump at the time of the Vicente Zaldivar expedition against Acoma on January 21, 22 and 23, 1599. This battle, which lasted three days, is perhaps the most famous and bloody in all New Mexican history. The Site of the Leap of the Padre. According to fiction he was killed, but according to Acoma tradition this Padre jumped off and landed safely in the sand and returned to Old Mexico. There seems to be no historical background for this story. The History presented here was complied from an excellent book on the history of the Gallup Diocese, written by Elizabeth Kelley. 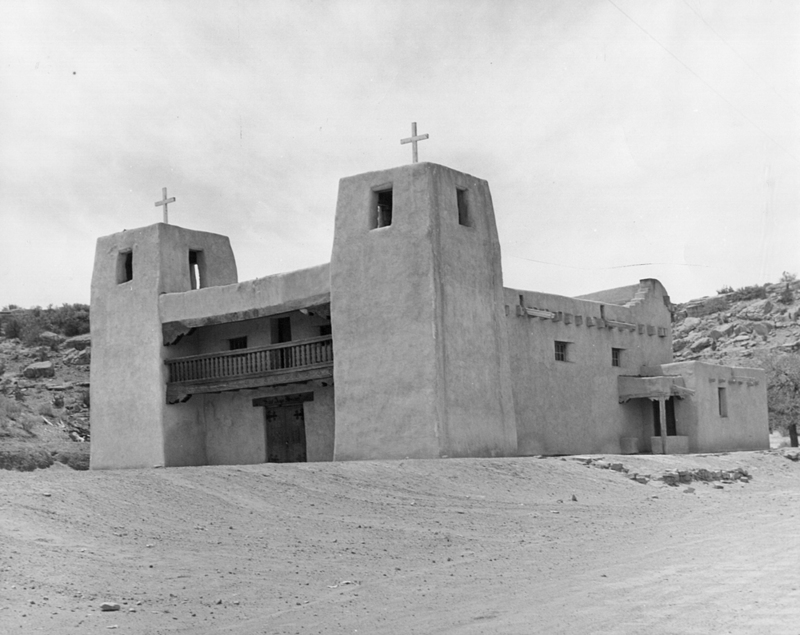 Additional information on the items of interest around the Acoma church was taken from a historical booklet stored in Diocesan Chancery archives.